Come check out this turn-key home with a newer roof, siding, A/C condenser with coil, and tiled updates and beautiful finishes. Through the front door and you'll fall in LOVE with the open style floor plan featured in your great room. Complete with vaulted ceilings and a tiled fireplace, it's the perfect space to relax. The kitchen is ideal for entertaining with rear yard deck/patio, a separate dining area, stainless steel appliances, and beautiful oak cabinetry. An attached 2.5 car garage allows for easy unloading, and a half bath allows for more comfortable living quarters on the main floor. Make your way upstairs where your Master suite awaits. Alongside two other well sized bedrooms and a second full bathroom. Yet, when you need just a bit more space the basement gives ways to your laundry room, flex/recreational space, additional storage and roughed in plumbing to add another full bathroom. The interior is gorgeous, but the park-like setting of your backyard will seal the deal! With a custom deck and stamped patio, crisp landscaping, full fence, and views that back up to open farm land, you'll always want to sip your coffee out back. Don't miss your chance to claim this wonderful home. 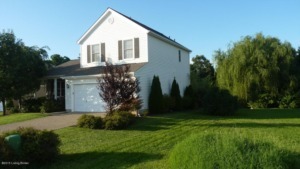 To schedule your showing, click HERE!